Soft, deerskin leather gives this rendition of the Kilty a luxe look and feel. Durable, high-quality leather is just the beginning. There's also the sporty, flexible sole; handstitching and rawhide laces to complete the Minnetonka look. 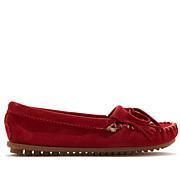 Treat yourself to a moccasin designed to last. These are best fitting and most comfortable shoes I have found in a long time! Will be looking for more in different colors. I love them they fit great. They are so so comfortable it feels like I don't any shoes on at all. Bought these for my Mom who used to sell Minnetonka's in a store she owed. Her last pair finally wore out! She ordered the Carmel color in a 9.5. The size fits just the same as so many years ago and it's so comfortable! She wants a lighter color in the deerskin style. Thanks for making her so happy! This was my second purchase of these moccasins. Both were ordered in white. I adore them. They are so soft and very stylish. Everyone likes them when I wear them. I am also a great fan of Minnetonka. Thanks. 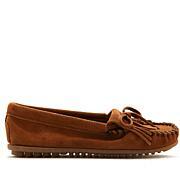 These deerskin mocs are so comfortable, the leather is beautiful and soft and fit like a glove, true to size. Thank you! You seek comfort in supportive shoes when you leave the house, why not show them some support at home, too? Upgrade your off-duty shoes to these foot-friendly slippers. Featuring a moccasin-style upper, these shearling-lined slipper are built on featherlight, ergonomically-shaped iQushion™ midsoles.